Expedited Shipping to Continental U.S.A. Inventory is integrated with our website. In stock items normally ship within 24 hours (Mon-Fri). Orders placed by 2:00PM ET (Mon-Fri) typically are picked up by the carrier that same day. Orders received after 2:00PM typically are picked up by a carrier the next business day, as day one of order/transit time. Canada: You can complete the check out process with a Canadian shipping address directly on our website! 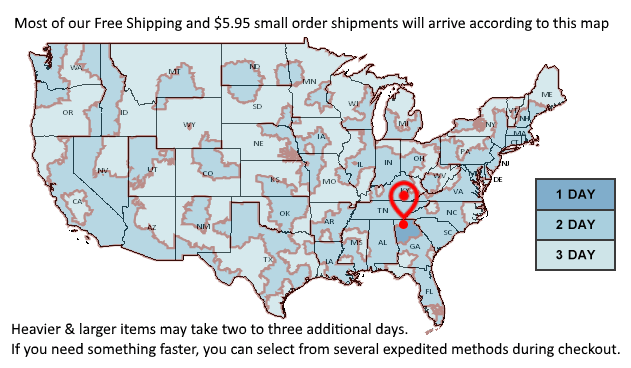 The shipping fee for an apparel item is $36 U.S. will populate as you go through the checkout process and enter your ship to address and postal zone/code. Hawaii and Alaska: You may purchase clothing/apparel and checkout on our website using Hawaii and Alaska ship to addresses. The surcharge is listed at checkout. For hard goods/equipment shipping to Alaska or Hawaii, please send us an email with the product, brand, size, and color (if applicable) along with your complete ship to address and zip code and we'll send you a quote. Shipment receipt is your responsibility. We supply tracking information to you so you should be aware of when your package should arrive. We may ship orders on a signature-required-at-delivery basis at our discretion. By placing an order with us, you agree that once the carrier delivers to your address, our liability for delivering the product ends (all Limited Warranties remain in force). If you feel a signature should be required for your shipment for any reason, please notate this on your order as you checkout in the 'notes' area.